Photo Caption:Jacob Dupps, Woodforest Bank; Bryan Cooper, Woodforest Bank; Renee Hall, Regional Manager of Southern Ohio; Brian MacConnell, Vice President of the Freestore Foodbank, and Mitchell Vocke, Woodforest Bank. 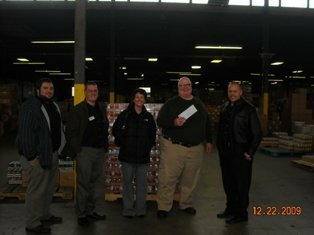 CINCINNATI, Ohio (December, 2009) – The Freestore Foodbank recently received a $2,700 donation from the Woodforest Charitable Foundation. The contribution will provide funding for its Kids Café and Power Pack programs. In the last 40 years, the Freestore Foodbank has grown from one man’s passion for helping his neighbors into one of the region’s largest food banks. The Freestore Foodbank distributes over 10 million pounds of food annually in 20 counties throughout Ohio, Kentucky and Indiana through a trusted network of over 400 local member agencies such as soup kitchens and shelters, food pantries, churches, daycare and senior centers, and many other community and social services organizations. The Freestore Foodbank is a proud supporter of the Kids Café program. Kids Cafe is an after-school program that offers tutoring, nutrition education, mentoring, and healthy meals to children at risk of hunger. Currently, the Foodbank operates 15 after school sites, serving over 8,400 hot meal per month. These sites such as schools, churches and community centers ensure that more children are getting the nutritious meals they need to learn and grow. For more information about the Freestore Foodbank, please call (513) 482-4500 or visit the Foodbank’s website at www.freestorefoodbank.org.